Explore the various packages in Julia that support image processing and build neural networks for video processing and object tracking. Hands-On Computer Vision with Julia is a thorough guide for developers who want to get started with building computer vision applications using Julia. Julia is well suited to image processing because it’s easy to use and lets you write easy-to-compile and efficient machine code. 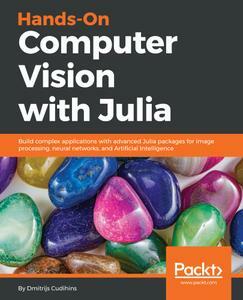 This book begins by introducing you to Julia's image processing libraries such as Images.jl and ImageCore.jl. You’ll get to grips with analyzing and transforming images using JuliaImages; some of the techniques discussed include enhancing and adjusting images. As you make your way through the chapters, you’ll learn how to classify images, cluster them, and apply neural networks to solve computer vision problems. In the concluding chapters, you will explore OpenCV applications to perform real-time computer vision analysis, for example, face detection and object tracking. You will also understand Julia's interaction with Tesseract to perform optical character recognition and build an application that brings together all the techniques we introduced previously to consolidate the concepts learned. By end of the book, you will have understood how to utilize various Julia packages and a few open source libraries such as Tesseract and OpenCV to solve computer vision problems with ease. Hands-On Computer Vision with Julia is for Julia developers who are interested in learning how to perform image processing and want to explore the field of computer vision. Basic knowledge of Julia will help you understand the concepts more effectively.